Ronon and McKay join Dr. Keller on an off-world errand of mercy, and must track her through the forest when a Runner kidnaps her. As Dr. Rodney McKay prepares to go off-world with Jennifer Keller, John Sheppard stops by. He’s puzzled that McKay would volunteer for a humanitarian mission on his day off. Undeterred, McKay reaches the gate room only to discover that Ronon is also accompanying Dr. Keller. They are all gating to M33-985 to contain an influenza-like outbreak. In the village, Keller examines a young boy. Before checking his mother, Erran, Keller sends Ronon and McKay to the nearby tavern. Later, after she fails to join them, the pair returns to Erran’s home and learn that Keller departed some time ago. A search is fruitless — but outside the village, Ronon finds two sets of footprints, one of which is Keller’s. McKay heads for the Stargate to call Atlantis. But before he can dial out, four Wraith dial in. One hears McKay and gives chase, catching him. He’s about to feed, when Ronon appears out of the forest and kills the creature. Ronon recognizes the Wraith as a Hunter, the sort that once tracked him (“Runner”). McKay and Ronon race back to the village. Erran knows of caverns the villagers have used previously to escape culling by the Wraith. Once the villagers are safe, the pair resumes their search for Jennifer. Keller, regaining consciousness in the forest, discovers that her hands are bound. The man who took her — Kiryk — is searching her bags, and warns that if she continues to ask questions or struggle, he will stun her again. The two resume their march through the woods, but Kiryk does not tell Jennifer why he has taken her or where they are going. Pausing later to hide their trail, Kiryk binds her legs. A Wraith suddenly appears, and Kiryk uses a device attached to his arm to disappear and reappear behind the Wraith, decapitating it. When they pause again, Keller breaks free and runs. Kiryk shoots her with a Wraith stunner pistol. He picks her up and sets off again. When she comes to, she agrees not to fight anymore. Learning that he’s a Runner, she offers to remove his tracking device — but Kiryk refuses. They set off once more, stopped by a sheer cliff face. Kiryk grabs Keller and her equipment bags, touches the device on his arm and teleports them to the top. Ronon and McKay find the Wraith that Kiryk killed. They press on. Suddenly, Ronon realizes McKay isn’t with him. McKay, stopping to remove a stone in his boot, is attacked by another Wraith. McKay draws his gun and manages to kill it as Ronon finds them. Grabbing the Wraith Hunter’s tracking scanner, they follow Keller and her kidnapper to the cliff face. Ronon’s tracking abilities are challenged by the fact that Kiryk’s tracks vanish suddenly. And they must get to the top of the cliff the hard way. Kiryk reveals that someone else needs Keller’s help. Keller asks again about the tracking device, pointing out they’ll all be safer if she can remove it. Her scan shows it fused to his spine and brain stem, making surgical removal impossible. Around nightfall, they reach a small opening in the cliff. Inside the small cavern, Keller finds a girl with a badly injured leg. Guilt-ridden because he led the Wraith to cull her village, Kiryk is determined to save Celise, the lone survivor. The two of them came to this planet when he learned a doctor from Atlantis would be visiting. Hiding Celise, Kiryk prepared traps for the Wraith who would inevitably follow him. McKay and Ronon narrowly avoid several of those deadly traps as they approach the cavern, where Keller is treating the girl. Convincing Kiryk that Celise must go to Atlantis for proper treatment, Keller also points out that the life of a Runner is not one for a child. A noise alerts them to the presence of Wraith, one of whom stuns Kiryk and threatens Keller and the girl. Keller manages to kill the Wraith and, knowing they can’t remain in the cave any longer, she carries the girl to a more secure location before going back for Kiryk. When he comes to, she proposes using defibrillators to short-circuit his tracking device. Without hesitancy, Kiryk agrees. Attaching a paddle to his back and his chest, Keller jolts Kiryk. His heart stops, but she is able to resuscitate him. The tracking implant has been successfully disabled — but so has his teleportation device. The three head for the Stargate. With the implant deactivated, the Wraith tracking device McKay is using stops working. Relying again on his skills, Ronon finds the clearing where Keller deactivated the tracking device. He also finds a doll Kiryk made for Celise. They are not far behind Jennifer — but now the Wraith are intensifying their search. Wraith Darts fly over the area. They manage to catch up to Kiryk and Jennifer, and Ronon attacks Kiryk. They fight until Keller stops them. As Keller tends her patient, Wraith attack. Escaping again, the group moves in the direction of the Stargate. Keller gives McKay the disabled teleportation device, and he manages to it en route. Seizing his teleportation device, Kiryk runs for the gate — guarded by a battalion of Wraith. Kiryk kills them, dials the gate, and dives through the event horizon as the rest of the Wraith hunting party follows. Appreciating Kiryk’s sacrifice, Ronon and McKay help Keller and Celise to the gate. In the Atlantis infirmary, Sheppard and Ronon visit young Celise. Sheppard promises to keep an eye out for Kiryk, and Ronon returns the doll she lost. Keller tells them Erran has agreed to take in Celise when she has recovered. Later, McKay seeks out Ronon, wanting to know Ronon’s intentions toward Keller. He leaves understanding that they are now rivals for the doctor’s affections. Behind-the-scenes images from what appears to be the filming of “Tracker” and “The Queen” are now online at the L.A. Times Web site. VOTE! 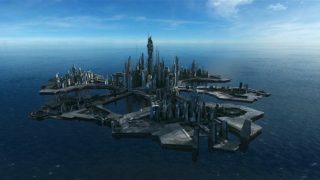 How would you rate Atlantis's "Tracker?"